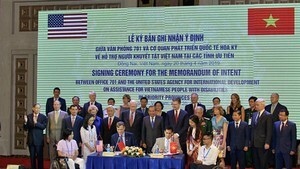 Some 500 disadvantaged families in the central provinces of Quang Nam, Quang Ngai, Binh Dinh, Phu Yen and Khanh Hoa have received financial aid worth a total of VND25 billion ($1.07 million) to build their own houses. The financial support was given by Hung Thinh Land JSC. 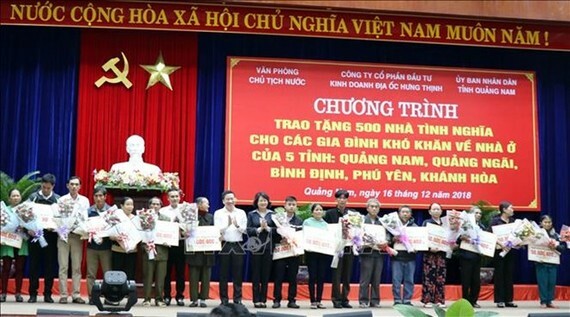 Vice President Dang Thi Ngoc Thinh presented the aid to needy households in Quang Nam province, each with VND50 million , at a ceremony in Tam Ky city on December 16. Speaking at the event, Vice President Dang Thi Ngoc Thinh said the Party and State always care for the life of poor people, particularly those living in central Vietnam who suffered from many losses during the past wars and have been struggling to make ends meet. Many of them are living in houses in very poor condition, she added. She also lauded the gesture of enterprises like Hung Thinh Land JSC, who has not only contributed largely to the State budget but also made generous donations to charity. Earlier this year, Hung Thinh Land JSC has funded the building of 190 charitable houses for disadvantaged households in Ho Chi Minh City, Vinh Long, Binh Dinh and Ba Ria – Vung Tau.